Wedding season--mostly the summer months-- is my favorite time of year. The local flowers available to us in Seattle are amazing and the colors are so, so vibrant. Dahlias are plentiful, the garden roses are spectacular and everything is alive and lush. Those summer months are what get us Seattleiets through our dreary winters. Wedding season is fun and overflowing with love though the wedding planning process is long and usually begins months before. Last March I met an adorable couple, Sara and Chris, for our first consultation. They described their wedding vision and we worked on making their dream wedding come to life. 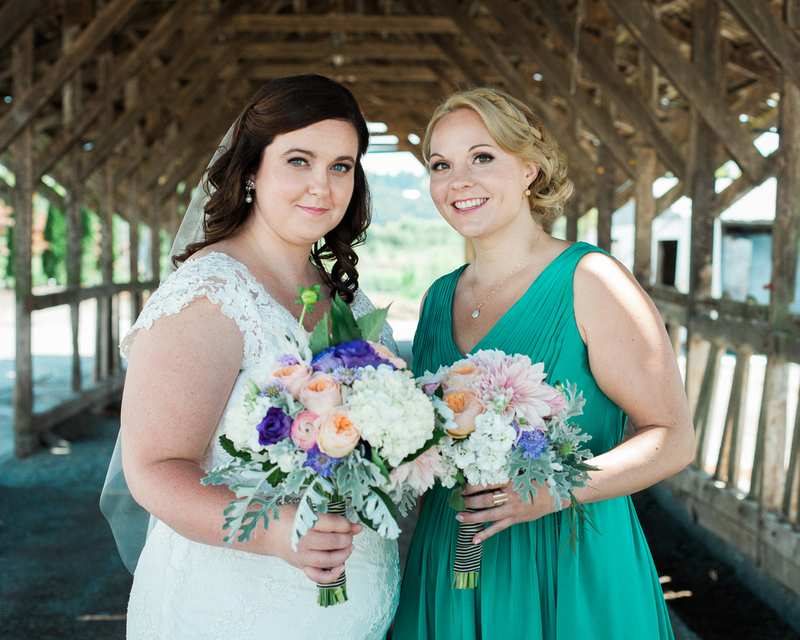 They were getting married at an rustic old dairy farm turned event space called Dairyland a little less than an hour outside of Seattle in beautiful Snohomish, Washington. The space is gorgeous! Dairyland has huge vintage whitewashed barn, beautiful gardens and millions of places for unique photos to be shot. Sara & Chris were married in the garden and had the barn set with long farm tables covered in lace for their barbecue and pie reception. Each place setting had a row of pastels macarons that matched the flowers perfectly. It was a gorgeous day suited for a gorgeous couple. The colors: soft muted periwinkle, sage, blush pink, white, coral, peach and purple. The haul: cafe au lait dahlias, juliet garden roses, dusty miller, light and dark purple lisianthus, scabiosa, peach and pink ranunculus, white hydrangeas, and spicy scented stock. I am so glad to have been a part of the marriage of these two awesome people. Here's to a long happy life together! p.s He sends her anniversary flowers all the time, it's pretty sweet!